This application has not been updated for quite some time now and should therefore considered out-of-date. Future updates are improbable if not excluded. Why should one think about the appearance of folder icons in Windows Explorer? Because one can. 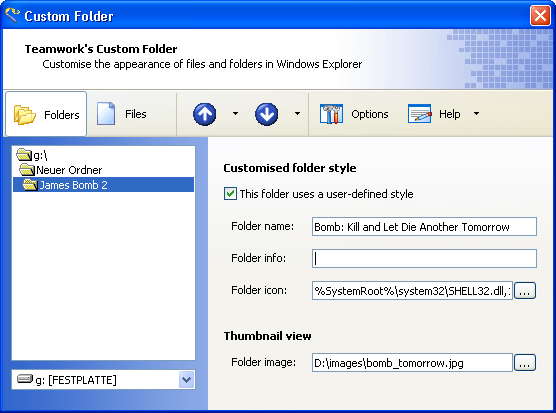 Custom Folder can set icons and images for your folders really fast. But that's not all: It can even set the folders name to some unusual text. Custom Folder can help to identify your folders faster. Give your special folders (like 'Games', 'Programs', 'Downloads', 'Websites') a unique icon. Group similar album folders by an 'Interpret: Album' scheme. Even unallowed characters like slashes, colons and suchlike are possible. All this won't temper with the original folder and file names as only the display name is altered. All changes can be reverted with a few easy steps.